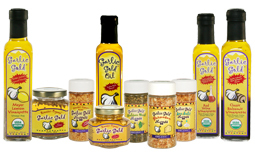 Garlic Gold® Oil is so versatile — you can use it to replace regular olive oil in just about every recipe! Just take these sandwiches, for instance. Salmon fillets are seasoned with just salt and pepper — it’s the pan-searing in Garlic Gold® Oil that gives them amazing flavor. 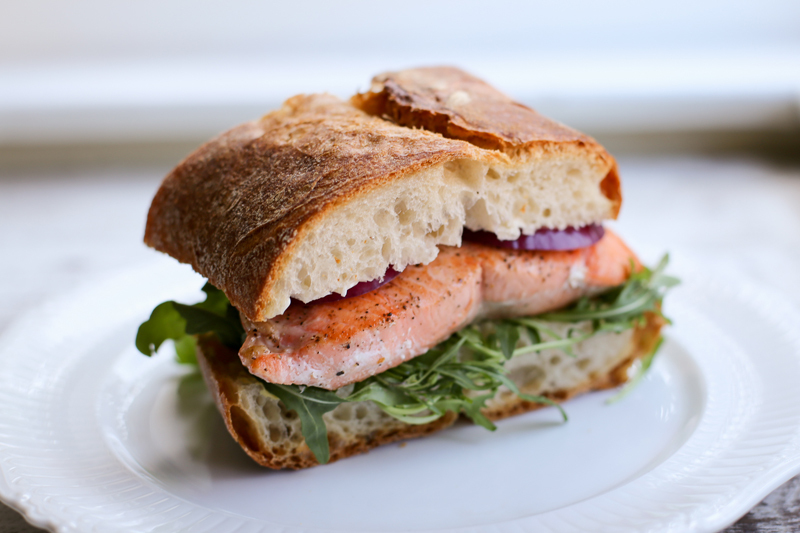 The salmon fillets are sandwiched between slices of crusy ciabatta bread with plenty of peppery arugula, spicy Dijon mustard, and a couple slices of red onion on top. They’re great for lunch or dinner, whenever you want a quick and healthy meal. Rinse and pat the salmon fillets dry, then season them with salt and pepper on both sides. Heat the Garlic Gold® Oil in a large (12-inch) nonstick or cast iron skillet over medium heat. When the oil begins to shimmer, add the salmon fillets to the pan — they should make a nice sizzling sound. Cook the salmon for four minutes, then use a fish spatula to gently turn the fillets over onto their second side. Cook the fillets for four or five more minutes on their second side, just until the salmon is cooked through and firm to the touch. Remove to a plate and let it rest for about five minutes. Slice off four sandwich-sized pieces of ciabatta bread, then slice each of these in half lengthwise. Toast the bread if you like. To assemble each sandwich, spread the mustard onto the bottom slice of bread, then layer on the arugula, salmon fillets, and red onion. Spread the mayonnaise on the top slice, then top the sandwich and serve.